As an organization interested in social justice and promoting social change, Social Justice Fund NW has funded a wide range of activist organizations working in communities of color. And Social Justice Fund NW has always believed it is important to reflect the diversity of our society in our own organization, including people of different races, nationalities, genders, ages, and sexual orientation. In the 1990’s, Social Justice Fund NW made major strides to become an actively anti-racist and inclusive organization. In 1997, the Board of Directors of Social Justice Fund NW decided to open membership in the foundation to people with a much broader range of incomes, and thus give Social Justice Fund NW a stronger democratic orientation and allow it to grow into a truly community-based foundation. The minimum contribution to join was first lowered to either $1,000 or one percent of their annual income and then, in 2003, to $240. As a result, membership soared, bringing an increase in members, more volunteerism, and greater diversity and representation from the communities that Social Justice Fund NW serves, both in the membership and the Board of Directors. Social Justice Fund embarked on the next step of democratizing philanthropy in 2010, with the first Next Generation Giving Project, a partnership with Resource Generation and our pilot Giving Project. NGGP was a huge success. We realized that through the Giving Project model we could not only make philanthropy accessible to an even broader range of people, we could also make it more sustainable and accountable through donor organizing. In 2011, we made Giving Projects our sole model for grantmaking. Through this model, 73 volunteers in 5 Giving Projects raised more than $300,000 from 479 donors, making 30 grants across 5 states. At their core, Giving Projects are about raising and distributing resources. Between 2010 and 2017, 54 projects have raised an average of about $100k each from a total of 8,000 donors. The vast majority of these donors were not previously giving to social justice issues. Many were not engaged philanthropically at all. Giving Projects have been especially successful at reaching traditionally underrepresented communities, including young people (about 75% of participants are under 35) and people of color (about 50% of participants), as well as people with wealth. Regardless of their background, most participants make their largest gift ever through the process. In addition to these fundraising outcomes, the Giving Project process engages people in transformative leadership development. Over 1,000 people have participated so far. We train with a social and racial justice framework through which participants come to view their volunteer and philanthropic activities. 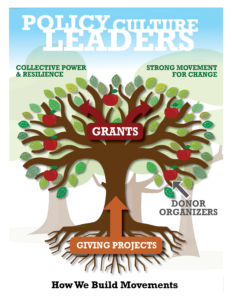 We provide training and coaching on fundraising, grantmaking, and grassroots organizing. All together, this has resulted in participants joining boards, launching independent fundraising campaigns, and getting directly involved with grassroots social justice organizations. Social Justice Fund NW is a member-funded foundation that supports the creation of a just society through fundraising, grantmaking, and member involvement. The foundation provides essential resources to organizations in Idaho, Montana, Oregon, Washington, and Wyoming to strengthen grassroots efforts in the broad-based movement for progressive, systemic social change. Our vision is of a world that is just, equitable, and environmentally sustainable for all. This multicultural world celebrates and supports diversity, community, intergenerational collaboration, and self-empowerment. Our image of success is a region with a thriving network of community-based organizations and coalitions and an increasingly equitable distribution and sharing of power and wealth. Our vision of SJF is to be a leader in social change philanthropy and to mobilize philanthropic resources to support social justice. We envision vastly increased funds to finance the work of social change organizations in the Northwest. SJF will continue to support new and established organizations and to empower groups to build internal strength and capacity. We also support networking and collaboration among nonprofits working at the grassroots. SJF will be a powerful and dynamic regional agent for social change, efficiently applying its resources to the needs of its grantees. We seek high visibility and active presence for SJF in Idaho, Montana, Oregon, Washington, and Wyoming. Through involvement in SJF, we envision members learning together, engaging in social change, and building community throughout each of the five states. We envision SJF to be a multicultural, antiracist organization that affirms human dignity and struggles against all forms of oppression. We strive to be a broad-based membership organization, collaborating across boundaries of class with our leadership reflecting the communities we serve. We believe that working with those who share a common vision, SJF and our allies will foster positive change. Social change activism – we believe in grassroots leadership and community organizing as a vehicle for social change. Empowerment – we value efforts to strengthen the voices of disenfranchised communities to promote human dignity and a more just society. Undoing systems of oppression – we support the empowerment of disenfranchised communities and the dismantling all systems of oppression that erode human dignity. Hope and optimism – we believe that we will achieve our vision through social change. Equity and fairness – we believe that resources should be available to everyone in society, and that human rights are more important than property rights. Progressive social change – our programs are focused on the root causes of social, economic, and environmental injustice. Risk-taking – we fund innovative, startup and existing grassroots organizations to support effective social change work. Grantee self-determination – we trust people most affected by injustice to organize their communities. Accessibility – we value a simple, transparent, and accessible grantmaking process. Democratic process – we invite member participation in SJF decision-making. We encourage everyone to use this power responsibly in supporting our constituencies and in shaping the future of SJF. Accountability – we hold ourselves accountable to the broader movement for progressive social change and we commit to applying our values to all of SJF’s operations. Broad participation – we create internal policies and procedures that encourage as many people as possible to join SJF’s membership. To see how our values are applied in our grantmaking, please read our Grantmaking Case Statement. Social justice philanthropy is the granting of philanthropic contributions to nonprofit organizations that work for structural change in order to increase the opportunity of those who are the least well off politically, economically, and socially. Researching root causes of social problems (like poverty, its implications, discrimination, lack of access to politics, public policymaking and the economy). Communicating and disseminating this information to the public, with a particular emphasis to reach those who are direct victims of social problems. Protecting and enhancing the legal rights of those who are marginalized in society or discriminated against. Advocacy and lobbying to enact changes in government policies regulations and programs affecting disadvantaged populations.